Darth Vader's head is on a church. This is not a joke. 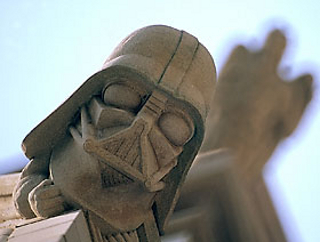 If you look carefully on the Washington National Cathedral, you can see a sculpture of the head of Darth Vader. The story behind it is that in the 1980's, National Geographic held a contest for kids to select a "grotesque" for the cathedral under construction. Third place winner Christopher Rader won for his drawing of Darth Vader. And so, it began. Oh, those wacky kids. What other Star Wars characters should be on a church?